It's hard to imagine French bakery, in all its chewy, crusty, and historically-significant glory as even remotely gluten-free. Of course, it's not so hard to simply remove all the wheat (the basis for gluten) from French bread, but would it be good? 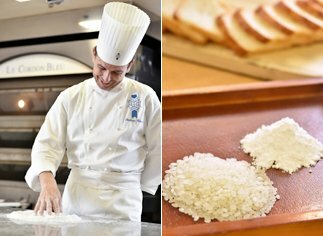 That's the challenge Le Cordon Bleu Japan Bakery Technical Director, Stephane Reinat, took on when approaching his Japanese ingredient, komeko. "Komeko is a great ingredient with a lot of possibilities. This time I'm going to demonstrate a bread that even those with wheat allergies can have," promises Chef Stephane. Komeko is rice flour, made from grinding down rice to a powder. It is a fairly common ingredient in wagashi (Japanese confections), but it is also gaining popularity in cooking and baking. Found to be richer in amino acids and lower in calories than its gluten-producing counterpart, the use of komeko is on the rise as consumer trends call for healthier wheat alternatives. Rice is not as exotic to the French as one may wrongly be inclined to believe. It occupies the same comfort food place as in many Asian countries. There is a dish called riz au lait in France, which is essentially sweetened rice with milk. No-frills and wholesome, it's the go-to sick food. "Riz au lait is comforting food. It makes people think of their grandmothers lovingly making it in their kitchens. Getting a little older, people think of rice puffs in chocolate. It was snack I had a lot of growing up." However, the French do not use rice to bake bread. Rice-flour based products tend to have a bouncier, almost gelatinous texture that isn't typically associated with French bread. "French people like breads that have a crunch," reasons Chef Stephane, "and French boulangerie has a long history. 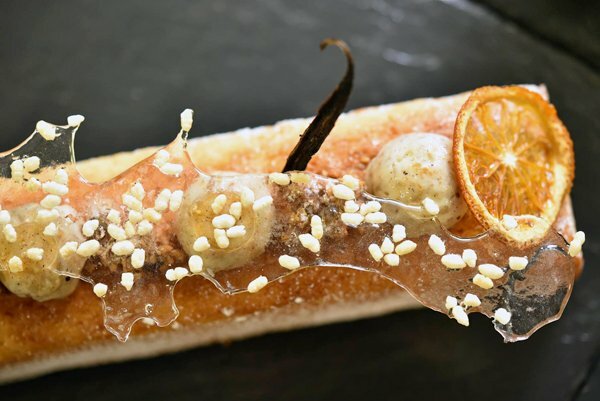 It's hard to change what people like overnight, so it may be another ten years before we start seeing 100% rice flour bread on French dining tables." On the other hand, rice-based bread is already on the market in Japan, though it is mostly made from a blend of rice and wheat: "Mixing [komeko] with regular flour, you can create a texture and taste that's similar to bread that people are used to eating. However, what I'm trying to do this time is make a bread that even kids who feel deprived because of their wheat allergy can enjoy. That's why my bread is 100% komeko." Decorative touches inspired by riz-au-lait. Bread dough made from rice flour lacks the gluten inherent in wheat dough to maintain its shape, so shaping the bread is impossible. To compensate, Chef Stephane baked the bread using moulds. He made three different loaves, all decorated in the way one would a pastry: "In France, bread with decorations are becoming popular, so in line with this trend, I'm also making decorated bread using rice as my inspiration." One draws from riz au lait, featuring decorations of rice cooked in milk. Another is based on rice puffs and chocolate, and finally a more Japanese rendition made from matcha dough topped with sweet natto. Chef Stephane's whimsical creations carry a subtle sweetness are supple texture from the komeko, but most importantly, they were unbelievably delicious. It's hard to imagine that with no flour whatsoever, bread can still be this good. "What I want is for everyone to be able to enjoy delicious bread, even if you have an allergy to something." It will take some time before 100% rice flour bread will become a bakery staple, even in Japan. 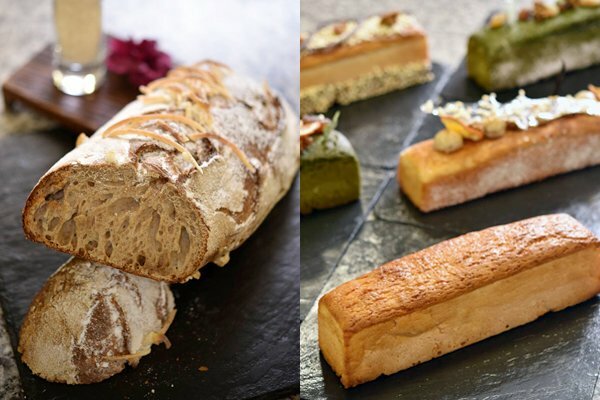 However, if talented chefs like Chef Stephane continue to produce spectacular breads like the ones he demonstrated, there is hope for rice flour bread becoming more than just a gluten-free alternative. Right：Made using 15% rice flour. Left：Made using 100% rice flour.